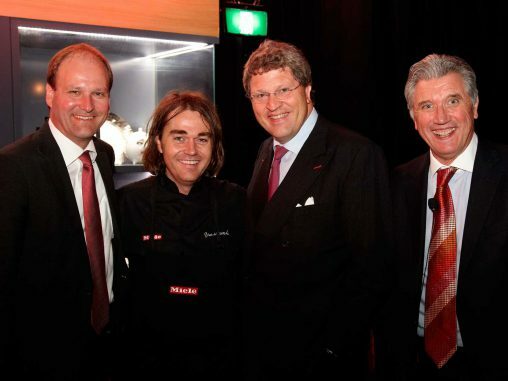 Dr Markus Miele, spokeschef Shannon Bennett, Dr Reinhard Zinkann and Miele Australia MD Michael Jeanes. One-hundred-and-fourteen years after their great grandfathers found each other and founded Miele, the two doctors that now preside over the famous German brand have a tendency to finish each other sentences. Dr Reinhard Zinkann, 54, is a charming and gregarious raconteur, nine years older than his more reserved co-owner and co-managing director Dr Markus Miele. Even after four generations, the dichotomy between the rulers of this “family company of two families” remains as it was for their forebears: Dr Zinkann is the sales and marketing guru focused on ‘premiumness’ and Dr Miele is the industrial engineer that wants to make things better. Imagine a world without Miele appliances — but with Zinkann instead? ‘Zinkann: Immer Besser’ and ‘the Zinkann Chartered Agency system’ — doesn’t quite have the same ring to it. Keeping the Miele name was a sticking point for Carl Miele when he partnered with the original Reinhard Zinkann to begin merchandising the brand in Westphalia, Prussia, in 1899. Because Carl Miele had the original idea for this new butter churn, the budding inventor was adamant that his family would have the majority share and the company would bear his name. Reflecting on this decision, Dr Zinkann, whose credentials were confirmed when he was named Horizon magazine’s Marketing Man 2008, agrees this was the right call. “A short brand name is much easier to communicate than a double brand name,” he said. Unanimity between the families is a longstanding and valuable trait for the business. When the great grandfathers unveiled the world’s first dishwasher three days before Wall Street crashed in 1929, the pair had to remain resolute, continue to invest in the technology and trust that eventually people would have the money to buy one. “Nobody in the Old World or New was interested in a dishwashing machine,” Dr Zinkann said. “Nobody knew the product, nobody could afford it and people thought it would break down or destroy glasses and china. Being a family-owned company gave Miele the leeway to unveil dishwashing technology in the same week that the Great Depression started. That independence from institutional investors, quarterly reports and aggressive short term growth targets is built into Miele’s DNA. Dr Miele said he and Dr Zinkann provide financial updates to their wider families “at least once per year” but are otherwise free to make and act on decisions with speed and agility. “When it comes to research and development, we can invest in longterm projects, where we know the return will not come next year or the year after,” Dr Miele said. Although Dr Zinkann was not totally accurate when he claimed appliance industry exclusivity on family ownership — Smeg is also privately held within the Bertazzoni family — he is right in espousing the view that it is rare and appreciated among Miele’s dealers, especially those retail chains that are similarly nepotistic. Phil Moujaes, general manager of the family-owned Bing Lee chain, said Miele’s success is emblematic of a “culture [that] comes from a family business that thinks longterm and not short-term like public companies”. Rob Sinclair, from another family-owned retailer, E&S Trading, said Miele was “a true family business” and that “you [can’t] help [but] be swept up and excited by this business that empowers its people to be innovative”. “[Miele is a] demonstration of a continuously innovative family company that never compromises on quality,” he said. Miele established its Australia subsidiary in 1980, when all these family companies were being run by the parents, and the handing down of these relationships is a significant part of the company’s mythology. Although unencumbered with the relentless need for growth that affects publicly listed companies, the two Doctors are cautiously ambitious. Miele reported earnings of 3.15 billion euros for the last financial year, which is up 3.8 per cent on the previous 12 months. Miele has no obligation or desire to reveal its profits, though Dr Miele said “we have competitors that did less” when asked about this. The best performing regions for Miele are Germany, Switzerland, Russia, the United States and Australia; all of which are growing steadily, though Dr Zinkann stressed that prima facie growth was not the first priority. “You could say we have grown above [market] average but the sheer growth isn’t as important as having sustainable growth, and [our current growth] seems to be sustainable and profitable growth,” said Dr Zinkann. Growth has historically not been smooth sailing for Miele. The flipside to the myriad advantages that come from being privately held is that you need cash in the bank or a robust debt facility to fund expansion. Miele eschews debt and, as Dr Zinkann said, “we cannot just go to the stock market and give out more shares…we have to earn the money”. That means it must be careful with how this cash is spent, to avoid the mistakes of previous management teams. For example, Miele branched out of appliances and into the transport industry in middle part of the 20th Century, manufacturing bicycles, motorbikes and even 125 cars (Dr Miele: “There is one car left in the Miele museum and we don’t know if any others are out there.”). “We have learnt our core competences, and to grow the business in our core competences, and not in businesses that are an aside to that. So if Miele isn’t going to grow by entering new categories, how can it grow? Not by reducing prices in a market share play, according to Dr Zinkann, who has previously told Appliance Retailer that if Miele weren’t able to control pricing via its pro forma business model, it would have withdrawn from Australia before the industry destroyed itself. Miele has entered a lot of new markets over the past two decades and more expansion is expected to maintain growth, though Dr Zinkann indicated that Miele’s real growth strategy is like Schrodinger’s Solution — concurrently the simplest and the hardest: make consumers pay more for more appliances. Earlier this year, Miele began rolling out its Generation 6000 range of built-in kitchen appliances. Although there is a nominal entry level in this range, it is ostensibly a high-end collection of well-featured, visually appealing, technologically superior ovens, microwaves, steamers and coffee machines. In theory, a customer could purchase just one of these appliances — the absolute cheapest is RRP $999 — but the idea behind this launch and its marketing is that once the houseproud home chef sees these sleek, streamlined marvels, with their dedicated Australian cooking programs and iPad-esque user interfaces, they will drop the ~$50,000 required for the full set. To make this happen, Miele needs a significant amount of buy-in from its dealers. These Chartered Agents, which have no traditional capacity to discount, must be vigilant in presenting Miele’s ‘premiumness’, according to Dr Zinkann, who can occasionally show a ruthless streak to match his conviviality. Once when visiting retail partners in Spain, Dr Zinkann was horrified to see Miele washing machines merchandised like they were just any old brand. “They were presented in a row with other machines: standing without any explanation, the price tag on it was the price tag of a completely different machine, there were no brochures around, no trained staff and it simply looked like any other machine — it was presented ugly and, naturally, there were no sales. Dr Miele said Miele appliances must be presented to retain the same look and feel in every store around the world. This is part of the brand’s ‘premiumness’ ideal. “We have the same positioning all around the world, so we have to make sure that if somebody moves from Sydney to Shanghai to New York to London, they have the same image of the Miele brand in London as he has in New York or in Shanghai. Before joining the family firm, after completely his studies, Dr Zinkann worked at BMW. This experience is reflected in the examples he uses and his thinking surrounding premium brands. “It is very important that a high-end product is shown in a different way to a low-end product,” Dr Zinkann said. Because appliances all pretty much do the same thing — clean clothes, cook food, clean floors — brands that expect customers to pay more must provide a wide gamut of explanation for this extra cost. Miele certainly spends a lot of money on its dealers, both in terms of training and entertainment. Throughout 2013, dealers from all over the world have been flown into the company’s Gutersloh head office to be inculcated in Generation 6000. Closer to home, Dr Zinkann and Dr Miele, along with local MD Michael Jeanes, hosted the cream of the Australian appliance retail crop at its Sydney Gallery for a trade launch that can only be described as decadent. The evening, catered by celebrity chef Shannon Bennett, included a performance by pianist David Helfgott, rumoured to have cost $100,000. In an industry where leading retailers are not unaccustomed to an overseas trip or a nice dinner at a vendor’s expense, this largesse stood out as being particularly effective — ‘once in a lifetime’ was the broad assessment from the various retailers attending. It is no surprise, therefore, that Dr Zinkann says “we need to have premium price points” to fund growth and maintain relationships.